In today’s economy, outfitting your hospitality staff can prove costly unless you zero in on the best sales. Summer sales offer an extraordinary opportunity to take advantage of overstocks in restaurant, hotel or country club uniforms. Before new fall and winter introductions of hospitality apparel, you can find great bargains on spa, resort, country club and casino uniforms. Because good-looking uniforms rarely go out of style, this is an industry that doesn’t have to rely on next-season trends for your employees to present a polished, professional look. 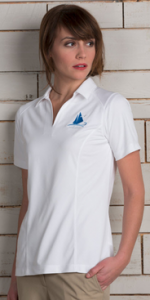 The best summer hospitality industry uniform sales are at Averill’s Sharper Uniforms, and most apparel is made in America for superb quality and durability. Among this summer’s best buys are Sharper Uniforms’ best-selling royal blue half bistro aprons. Each of these U.S.-made restaurant aprons has one center divided pocket, extra-long apron strings, expertly finished ends and a rectangular waist. It’s a sharp look in a deep blue shade that will complement staff apparel and your décor for any season. Our cotton poly blend aprons resist soil and wrinkles. Like regular apparel on sale all year, summer sale uniform shirts, aprons, jackets and vests can be customized with logos or names printed or embroidered directly onto each piece. This summer, you’ll also find marvelous deals on stylish kitchen baseball caps, restaurant aprons and staff favorites like Extreme Performance moisture-wicking polo shirts for men and women. Shop this year’s lowest prices on brocade banquet vests, quilted hotel jackets for women, chef’s pants and premium chef coats. Summer is the time to shop for uniform accessories like silk ties and loop ascots, too. A resort staff favorite now on sale is the Sahar women’s spa jacket with flattering princess seams front and back, mandarin collars and stylish, easy-movement six-inch side slits. This spa/salon jacket has two lower pockets and elbow-length sleeves. These American-crafted spa jackets rely on exclusive arcDry technology to wick away moisture and arcRelease fabrics that easily release soil when laundered. A touch of spandex has been added for a better fit. So start shopping, and save. But remember: like summer, these sales won’t last for long.